The Greatest Showman is a fantasy wrapped up in a glitzy musical, featuring a fantastic cast and foot-tapping tunes. Although it won’t suit many viewers, it is sure to find an audience who appreciate its somewhat old-fashioned style. While assisting his father in preparing a suit, a youthful Phineas Taylor Barnum meets Charity Hallett, and both of their lives will never be the same. Her patience and acceptance of him despite his flaws are the perfect match for his imagination and lust for life. After starting their family together, a financial crisis provokes Barnum to invest in a museum of curiosities. His hope is to earn enough to keep a roof over their heads and food in their bellies. It would be hard to have missed the media blitz that accompanied the release of this Hugh Jackman vehicle. When Oprah listed the Original Soundtrack among her favourite things of 2017, the hype reached another level. The soundtrack is fantastic, but that kind of advance publicity can be hard to live up to. Jackman and his co-stars are more than capable of meeting the challenge. Apparently something of a passion project for the star – he had signed on in 2009, but it took years to get funding – Jackman gives his all in every scene. He shines as the singing and dancing Barnum. It is hard to imagine another actor in the role; Jackman is just that good. In fact, there aren’t any other actors with the necessary talent in so many different spheres. It’s almost as if it the part was created with him in mind. Michelle Williams has been appearing in quality dramatic roles for years now. The Greatest Showman might be considered lightweight in comparison. Nonetheless, she ensures her scenes carry the appropriate gravity and is an excellent foil for her enthusiastic on-screen husband. She also sings in several tracks and demonstrates a unique voice. The twelve-year difference in age between Jackman and Williams is awkward, although both try to make it work. The remaining stars – Zac Efron and Zendaya – have a little less screen time. They do share a romantic duet complete with a trapeze (Rewrite the Stars) that must have taken many takes to get just right. Efron and Jackman also share a foot-tapper (The Other Side) which is almost stolen away from them by the actions of the bartender in the background. The Greatest Showman does have problems, mainly in its pacing. There are periods during which time flies, and every new scene is a joyful surprise. There are other sequences, however, in which one can see the machinery working. Themes are telegraphed for a return later in the film and, at times, exposition slows things down. 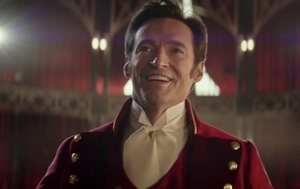 Despite these quibbles, The Greatest Showman is a fabulous experience from start to end. The film does demand the suspension of disbelief as some critics will contend. (At least it is not to the extraordinary degree of the now infamous Leia scene in The Last Jedi.) If you can accept the enthusiasm of the cast and crew and relax and enjoy their fantastical creation, you will be in for a beautiful ride. This entry was posted in Film Reviews by Mark Lavercombe. Bookmark the permalink.